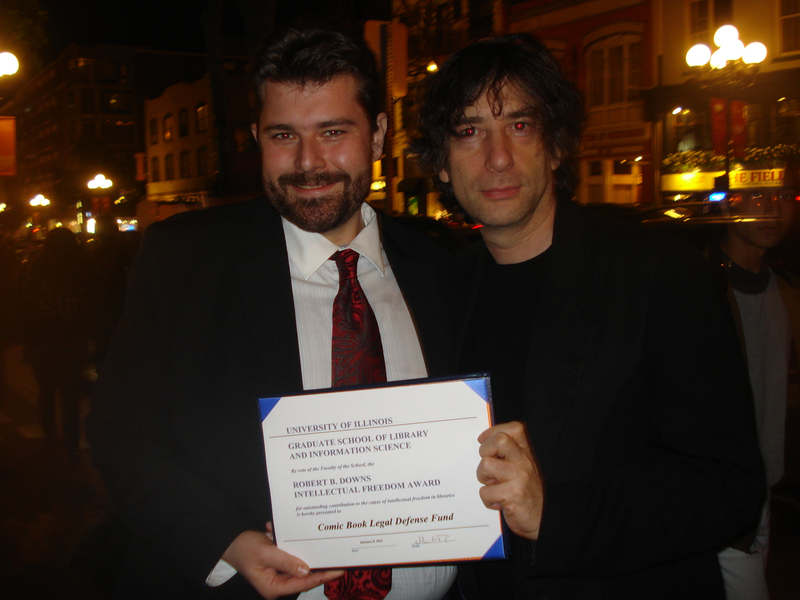 Last weekend, the Comic Book Legal Defense Fund was presented the Robert B. Downs Intellectual Freedom Award, an honor presented by the Graduate School of Library and Information Science at the University of Illinois at Urbana-Champaign to acknowledge individuals or groups who have furthered the cause of intellectual freedom, particularly as it impacts libraries and information centers and the dissemination of ideas. The award was presented last Saturday at a presentation during the American Library Association midwinter conference, and accepted by CBLDF Executive Director Charles Brownstein. His acceptance remarks highlight the rise of comics from being hobbled by junk science in the 1950s to their near universal embrace by contemporary culture, and are presented in full after the jump. 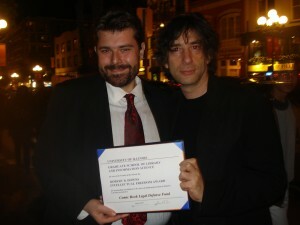 CBLDF Board Member Neil Gaiman & Executive Director Charles Brownstein with the Downs Intellectual Freedom Award. Photo by Cat Mihos. On behalf of the membership, board of directors, and staff of the Comic Book Legal Defense Fund, I’m here to thank you for bestowing this tremendous honor upon us. When the CBLDF was established 25 years ago, it would have been unfathomable that comics would be at the center of today’s cultural conversation. It would have been equally far-fetched that an organization established to protect the medium’s rights would be honored by a distinguished gathering of information professionals. The world has come a long way, and this award vindicates the efforts of the many great advocates who have toiled to advance comics as an important form of literacy and speech. When the CBLDF was established 25 years ago, comic books were still second class citizens in the world of information. Our stories, and the people who created them, read them, and sold them were regarded in the general culture as trashy and low. Comics were the exclusive province of the most primitive audiences. The stigma dated back to the late 1940s and early 1950s when the medium was blamed for everything from declining literacy to increasing juvenile delinquency by the kind of junk science that plagues every new, popular medium. Unlike new media that developed after comics, however, junk science succeeded in diminishing them as a form of expression. The sensational allegations that comics were harmful to minors captured the public’s attention and resulted in Senate subcommittee hearings that led the comics industry to choose a path of severe self-censorship, fearing that otherwise they would be regulated or boycotted out of existence. The one-two punch of popular belief that comics were dangerous to youth, followed by the sanitizing effects of self-censorship, led to a lasting stigma that comics were for kids and morons and not worthy of protection or consideration. Of course, information wants to advance, artists want to create, and audiences want to receive the stories that challenge them in the media that speaks to them. In the thirty-some years between the Senate subcommittee hearings and the establishment of the Comic Book Legal Defense Fund a new wave of authors, entrepreneurs, readers and educators emerged who did consider comics worthy. They developed subject matter that used the power of words and pictures to tell stories of value to audiences of all ages. They found new formats, new idioms, and new distribution avenues that allowed these stories to reach those audiences. It was in one of those distribution avenues, a humble comic book store in Lansing, Illinois, that the need for the Comic Book Legal Defense Fund would arise. A store clerk, Michael Correa, was arrested for selling a handful of alternative comic books to an undercover police officer. It seems this local authority was incensed that the comic book medium, which he, like so many, believed was strictly for children, was being used to tell stories with nuance that spoke frankly of subjects of adult interest to an adult audience. The court agreed and convicted Mr. Correa of distributing obscene material. It was then that Denis Kitchen, publisher of some of the comics that were prosecuted, called the industry to arms to raise money to appeal Correa’s conviction. With the proceeds, Kitchen hired First Amendment pioneer Burton Joseph to wage the appeal. It was a success. Kitchen foresaw that this wasn’t likely to be the last case of this nature and established the CBLDF as a permanent concern. It’s good he did, because he was right, and cases continued to emerge that prosecuted people because they sold, or made, or read comics. For 25 years, the CBLDF has fought for the principle that comics should be afforded the same First Amendment protections as other serious forms of media, including prose, poetry, movies, gallery art, and television. Our battles have taken us to aid other retailers, as well as artists, librarians, and readers who have faced prosecution or challenges because the comic books they made, or read, or distributed were not regarded as art worthy of First Amendment protection. But the First Amendment is not a barometer of taste or merit, it is a guarantee that the intellect of our nation can take the shape it chooses. It is a guarantee that ideas can take root in whatever idiom best suits them, and that our population can access those ideas without fear of prosecution. It’s a guarantee that the CBLDF strives to protect for the medium we serve. And we’re humbled to stand in a room of professionals who strive to protect that guarantee for the patrons they serve. Since the CBLDF was formed, comics have grown out of the stigmatized ghetto of low culture, and have become a significant force in the world of information. Though the courts and the censors have yet to fully catch up with the notion that comics are protected speech, and prosecutions still arise, we have the wherewithal now to stand up to those challenges. We are pleased to be recognized with today’s honor for performing that work. New media, new types of stories, and new information will always have their detractors. It is up to those of us who believe in the power of intellectual freedom to see past the shock of the new and different, and to defend that material against those who would silence it. Thank you, everyone, who has helped the Comic Book Legal Defense Fund do that for comics. More importantly, thank you, everyone who joins us in protecting the guarantees granted by the First Amendment.